For sixty plus years we were king of the world and when the king spoke the world listened. Today the world is evolving where a plurality of nations share the throne. These include, China, the Eurozone, Russia and ourselves. 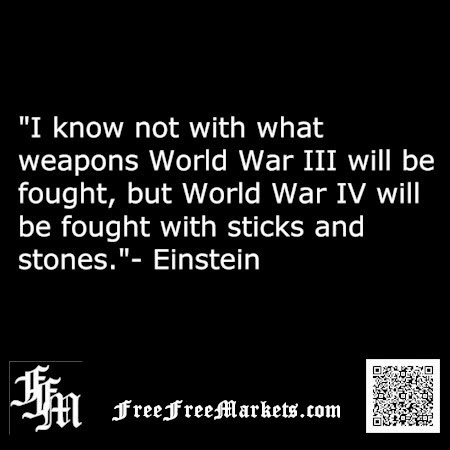 Unless we are willing to risk the war of all wars that is the future. We are presently negotiating an Asia-Pacific trade agreement that includes Australia, Brunei Darussalam, Canada, Chile, Japan, Malaysia, Mexico, New Zealand, Peru, Singapore, Vietnam and the United States. We should not be assuming that China is going to sit still as we finalize the pact. I assume there is someone in the State Department contemplating how we are going to act when China begins negotiations with Cuba, Venezuela. Mexico, Argentina, Brazil, Chile and others. Will we be sending a fleet of ships off the coast of Chile as China increases trade with South American nations? There are many people complaining how NAFTA hurt the American worker. While we held ourselves to minimum wage and strict worker safety standards, improving pollution control and other requirements that added to the cost of production in North America, other nations did not. The result was a loss of jobs in the United States. To make this result even harder to swallow, large multinational companies domiciled in the United States shut down plants here and opened new plants in the countries that had cheaper production costs. They got the best of both worlds. Cheaper production cost and maintenance of an existing U.S. customer base resulting in higher profits and margins. Within the United States we pride ourselves to be a democracy. Going forward we will need to learn how to share the throne with other nations in the world. Maybe what we need is a good old fashion war with another planet to unite earth.